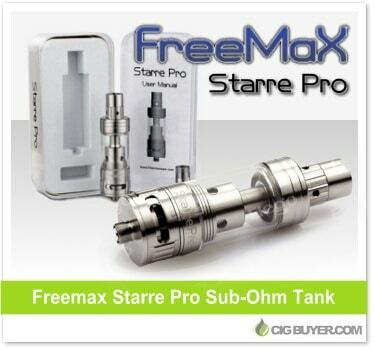 Building upon the original Starre Tank, the Freemax Starre Pro Tank has a number of improvements, including a new top fill design, two large adjustable cyclops air slots for even more airflow and pure nickel Ni200 coils for use with temperature control mods. The dual vertical coil heads have a resistance of 0.15 or 0.25 ohms, are made with Japanese organic cotton and can be run between 20-100 watts. Although the e-juice capacity has been slightly reduced to 4ml, it isn’t too shabby for this cloud producing beast.